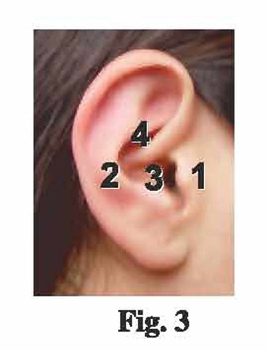 Fitting Doc's Proplugs (DPP) is worded for the right ear: Measure Auricle (Fig. 3 #3) with transparency (Fig. 1). Pick a DPP from Fitting Set engraved with size equal in size to black silhouette on sizing transparency. Grasp the DPP with right finger tip in the cup of the right DPP and pinch it with right thumb at the lower curved part (fig. 2). The arrow top (fin) of the DPP fits into the Crus Helix (Fig 3. #4). Twist with fingertip back and forth to make sure DPP is in tight between the Tragus (Fig 3. #1) and the Antehelix (Fig 3. #3). Do not jam rectangular knob into the right round canal. Now, do the "HUM" test. HUM, and if the sound travel toward the right ear, you have the correct size. If the HUM test is negative, try a smaller or larger size. With the correct size DPP, the sound will be louder on the right side. 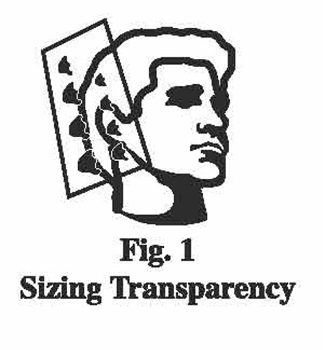 Where do you find a Sizing Transparency? When you order a Fitting Set you will also receive a sizing transparency. What to do if you feel you are in between sizes? We recommend that you use the largest size that feels snug to you. 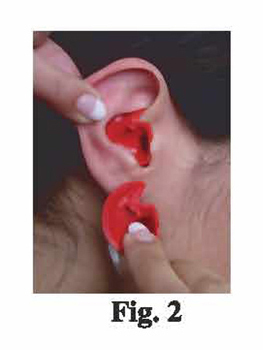 Ask your local ENT physician or a sports store about Doc’s Proplugs and asked to be fitted for your own custom earplug.